Jake Johnston is a Research Associate at the Center for Economic and Policy Research (CEPR) in Washington D.C. He is the lead author for CEPR’s Haiti: Relief and Reconstruction Watch blog and has authored papers on Haiti concerning the ongoing cholera epidemic, aid accountability and transparency and the U.S. foreign aid system. His articles have been published in outlets such as Boston Review, The Hill, AlterNet and Truthout. 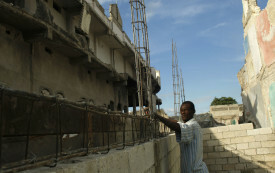 Is USAID Helping Haiti to Recover, or US Contractors to Make Millions? The international community pledged enough aid to give every Haitian a check for $1,000. The money went elsewhere.